The Top and Bottom Digital Screens have all the same option but are controlled independently. Touch the right side of a screen to cycle forward in the functions and the left side to cycle backward. When on the time touch the center of the screen to change from 12h to 24h. When on a other function touch the center to get more options. 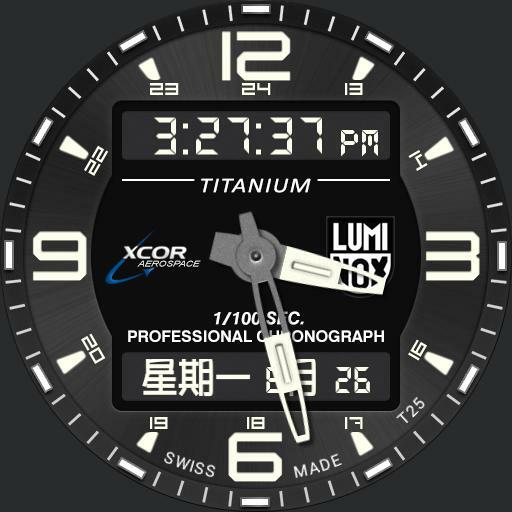 The Chronograph Start/Stop are on the left side logo when on chrono on any other function it will change the colors of the Lume and Dimmed. The the reset is on the right side logo and on any other function it will change the texts color. Touch the middle of the watch to enter the setting mode.